Whoops! I forgot the strawberries and Cool Whip in this picture. Okay, I need to put a little disclaimer out there. Those of you who follow my blog know that I am pretty passionate about cooking from scratch, but there are times that I have found the store bought options to work a little better. The store bought sugar cookie dough is one such example. Obviously you can use homemade if you like, but we have found, over the years, that it does not set up the same way that the store bought dough does. To begin you are going to preheat the oven to 350 and open the logs of dough. Using your technique of choice, press it into the bottom of a sheet pan. I will tell you that you will need to either butter your fingers or spray them with cooking spray here to keep the cookie dough from sticking to your fingers. Once the oven is preheated, place the sheet pan in and cook for 14 minutes. After 14 minutes, take the sheet pan out of the oven and set aside to cool. While to cookie crust is cooling you can make the "sauce". Place to room temperature cream cheese into a mixing bowl. Add the 2 cups of the powdered sugar. Finally add the Cool Whip and then S-L-O-W-L-Y begin to mix. Once the sugar, cool whip, and cream cheese have blended together, you can pick up the speed a little. Oh! I almost forgot! I like to add a little vanilla extract. It just adds a little something, something to the "sauce". AS SOON AS the cookie is cool, dollop the "sauce" on top. If you let the crust cool too long it will become VERY crispy and hard so as soon as it is cool to the touch, sauce it! Smooth it out, cover it with cling wrap, and put it in the fridge for up to 3 days before you are ready to serve it. This is the step that I had the most experience with growing up, and it is a great way to get your family and friends involved in the big day. 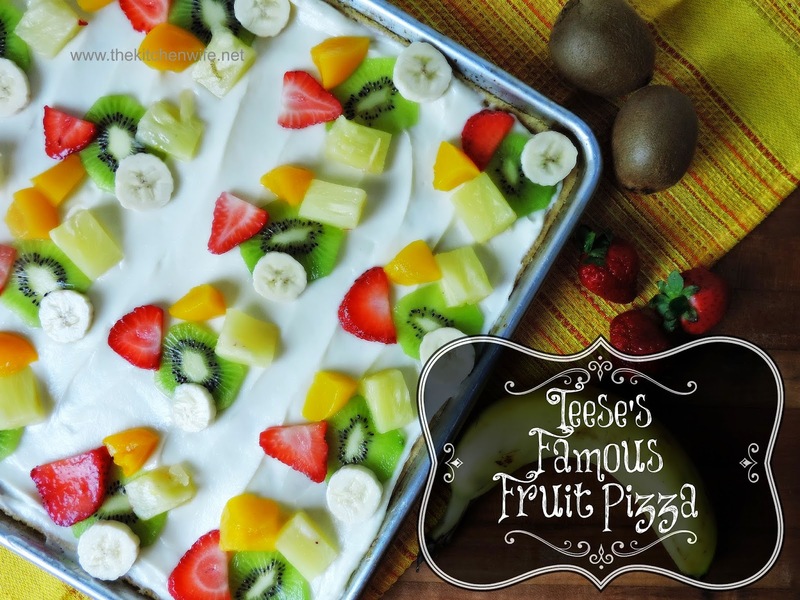 On the day you are ready to serve, take the pizza out of the fridge, and place the fruit toppings on. 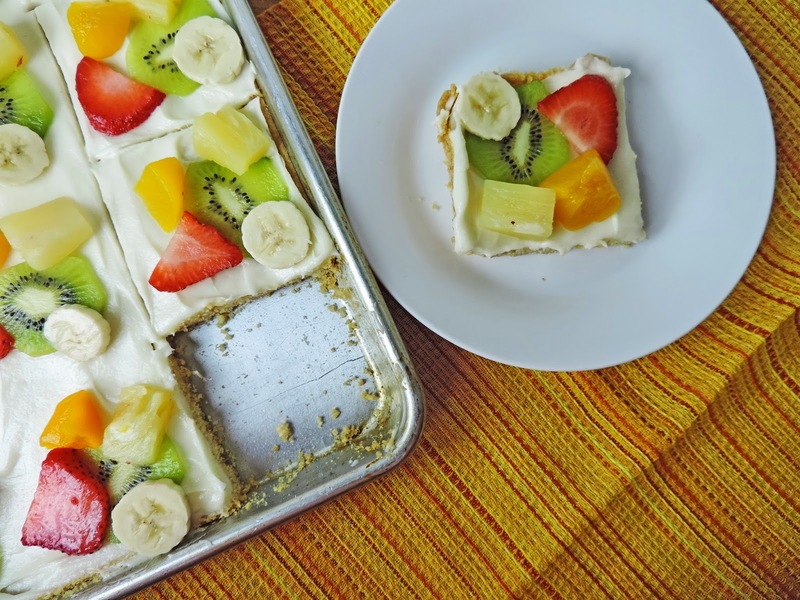 I personally like to group them in slices, but hey, if your kids are helping let them have fun and go at it! You can use any fruit toppings you like here, but this is ALWAYS what my momma uses so it's what I use as well. Slice into pieces, serve, and enjoy!!! Open the logs of cookie dough and press into the bottom of a sheet pan. Place into the oven and cook for 14 minutes. After 14 minutes, remove from the oven and set to the side to cool. Add the cream cheese, confectioner's sugar, and vanilla extract to a mixing bowl and SLOWLY mix together. AS SOON AS the cookie crust is cool to the touch, spread the sauce out over the top. Cover with cling wrap and place in the fridge for up to three days. On the day you are ready to serve, top with the fruit and slice.